RE: Lincare: You signed it, so we can charge you whatever you owe.. Please continue to use this thread for discussion of Lincare and related DME/Insurance issues, etc. lol.. Sorry! Computer died this weekend I'm going to try and post images at the new link that was posted shortly. (02-14-2015, 11:45 PM)lab rat Wrote: So has she stormed their offices with a pump action rifle and blamed ISIS yet? 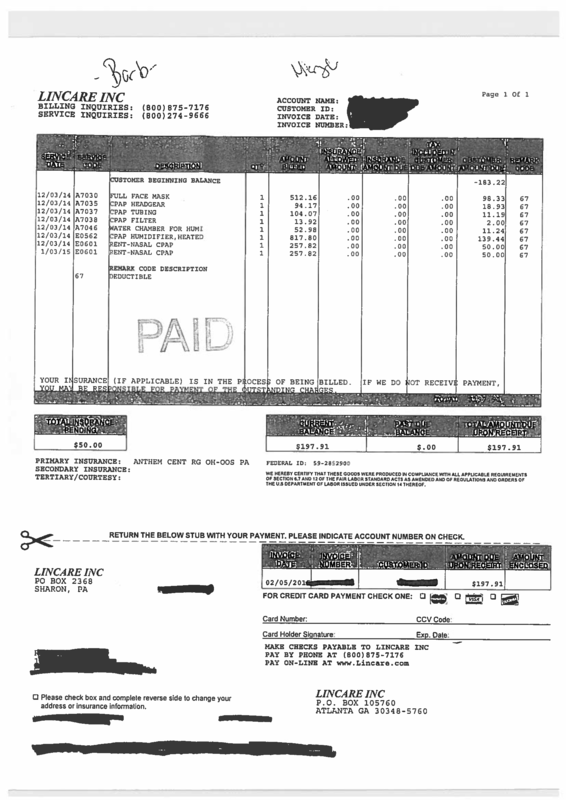 You can see the full amount amount Lincare bills, and the allowable charges under your insurance contract. You only owe the allowable charge. As you can see, they follow standard Medicare billing procedures, invoicing for each component. The full face mask, head gear, tubing, filter, water chamber, humidifier, are all invoiced separately. Your allowed costs are pretty competitive with online costs, and are being applied towards your deductible. It looks bogus because that is not how we usually buy things, but it's really standard billing procedure. Your CPAP is renting for $50/month. I don't know how long that term is, but I suspect it is for several months, then a lump sum payment to buy the unit. I'd want to know those details. You have a good unit, and I think at this point you should stick with it unless the ultimate charge for the Autoset is just absurd. Find out what the rental period is and insurance allowed purchase cost. Without the insurance discounts this would be crazy, but it looks like it should work out okay unless this is a permanent rental. The only way it would be less expensive is if you got a used machine. I agree they're competitive its just the damn heated humidifer I think is a scam. How can they charge me for something that doesn't exist by itself? I can go out and buy a mask, headgear, tubing, water chamber and the like but I can't purchase a heated humidifer for this unit so why list it separately? My boyfriend just called and said Lincare sent me a letter via UPS.. that's can't be good lol. Just wanted to let all you good people know that Lincare called today and they are refunding my money! So I guess if you want them to actually get off their butts and do the right thing you need file a Complaint with your State's Attorney general Consumer Protection Division. I asked the supervisor why this couldn't have been done by the numerous supervisors I spoke with previously, why i had to file a Complaint before they'd do the right thing and she said she didn't know why but she was going to have a meeting with all the supervisors (not holding my breath on that one). Do they actually bill $512.00 for a full face mask??? How much do they actually get? ?